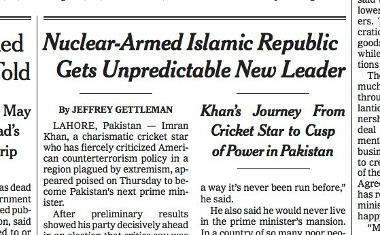 Imran Khan election win in Pakistan receives a hostile reaction in U.S. and British media. The headlines are generally negative and the descriptions of Imran cast a damning light of him. Mr. Khan seized on a single issue: governance. ... He focused on corruption, repeatedly stating that a few political dynasties had shamelessly enriched themselves. ... [H]e seemed adept at not letting the gossip pages distract him, and he kept hammering on about corruption. Many analysts wonder how long Mr. Khan’s friendship with the military will last. “He is known to have erratic behavior and a very unpredictable personality,” said Taha Siddiqui, a journalist and critic of the military who recently moved to France, saying he feared for his safety. Siddiqui worked for an Indian TV channel and for France24. He has long been critical of Pakistan's military. In January he claimed that "he was attacked by up to a dozen men en route to the airport in Rawalpindi but managed to escape". He clearly dislikes that Imran Khan has good relations with Pakistan's military. Why is that enough to make it in into a headline? It's a cheap point. During the last 50 years there never was a prime minister of Pakistan who could act against the will of the powerful military. If the Bhutto clan and its PPP party or the Nawaz clan with PML-N had won the election their candidates would have had similar restrictions on foreign policy than Imran Khan will have. “Candidates with large political appeal and financial means, the so-called “electables” were reported to often dominate the campaign. Uneven rules on campaign spending further undermined candidates’ equal opportunity,” the EU EOM observed. Rich candidates spend more than poor ones and have a higher chance of winning elections. That is unfair. Have we ever heard of any other 'democracy' with a similar problem?